Allure On Currumbin is a small elegant French restaurant situation in Currumbin – a 30 minute drive from all the tourists and big fancy restaurants in Surfers Paradise and Broadbeach on the Gold Coast. As a moderately expensive restaurant, Allure’s target market includes tourists – therefore the challenge was to attract tourist attention and lure tourists to travel the distance to experience Allure On Currumbin. 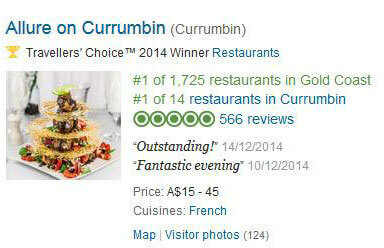 Grow Allure On Currumbin’s reputation and get them highly ranked on Trip Advisor – the number 1 most used tourism review and referral platform. We carefully and strategically respond to every single review posted about the restaurant on Trip Advisor. On average, customers read 11 reviews before making a decision, so the brand response to positive and negative reviews is critically important. Our strategy is to push and reinforce positive marketing messages, while managing and combating any negative reviews. Allure’s ranking on Trip Advisor soared, and they became rated #2 restaurant in Australia in 2015, and are consistently ranked #1 for the Gold Coast. An immaculate reputation, resulting in an increase in word-of-mouth bookings.